Next to the official version there is also a remix released. The Sidelmann remix has been released through the usual digitessen and can also be heard on Spotify. Australia's dedication to Eurovision was celebrated by a segment in the 2nd semi final. After a clip where the continent was dropped in Europe (almost smashing the British isles) there was a performance by Jessica Mauboy. 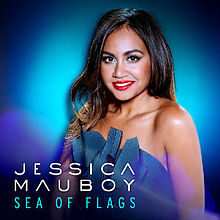 Her song Sea Of Flags is released (digitally) through all the usual digital stores. On may 2 she also released her single Never Be The Same, also on cdsingle in Germany. Momoland entertained the world in the interval in the final. Their reworking of Beethoven's 9th (titled Joyful) is now released through your favorite digital stores. All the songs and many of this years versions have been released through digital stores. Not all are specifically mentioned in each country's page, I'm sure you can find them for yourself. iTunes is the most popular source and there are many sites dedicated to lists with iTunes sales. The one to visit for all your Eurovision updates is Esctracker. Like last year you can see which entries are selling in which countries. If you click the option Previous Years the list will also include entries of past years in the lists. (And boy, is Euphoria still doing well!). Another iTunes list page I like a lot is this one.